Buying Coin Collections from Estates, Inheritance and Collectors looking to sell. We buy it all! ▪ Should I clean my coins? ▪ Are all old coins valuable? I just inherited a collection and have no idea what it is worth. Can you help? How much are my coins worth? Why sell via the mail? Is it safe to sell coins via the mail? Why not just sell them on eBay? A coin magazine said a particular coin was worth $100. Why can I not get $100 for it? Should I clean my coins? The Seated Liberty Dime made its introduction in 1837 and was produced through 1891. The dime obverse shows Liberty in a seated position, hence the name. As with most Seated Liberty coinage, it was heavily used so surviving pieces are typically worn. Even so, worn pieces are often worth more than silver melt value.. Coins in better condition though will carry decent premiums. Anywhere from a few dollars and up. The dime pictured below is very worn. 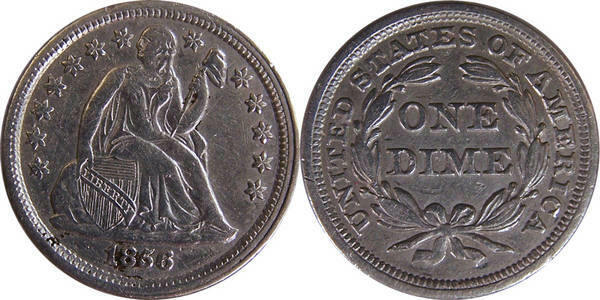 If you have a hoard of Seated Liberty Dimes, please contact us for a offer. We will buy all silver coins dated 1964 and before.